Victor's and Barbara's 2012 Blog Page. To celebrate our 15 years together, Barbara and Victor decided to splurge on an extravaganza. We booked top seats for "The Magic Flute" (Mozart) at the Sydney Opera House, and combined these with an accommodation and dining package at a 5 star hotel right on Circular Quay. 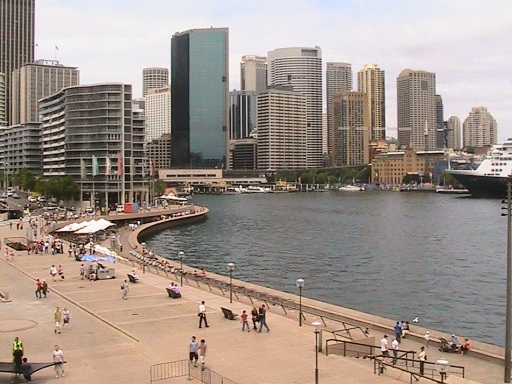 On 30th January we flew to Sydney and stayed a day with Kim and Russell, then took the train to Circular Quay. 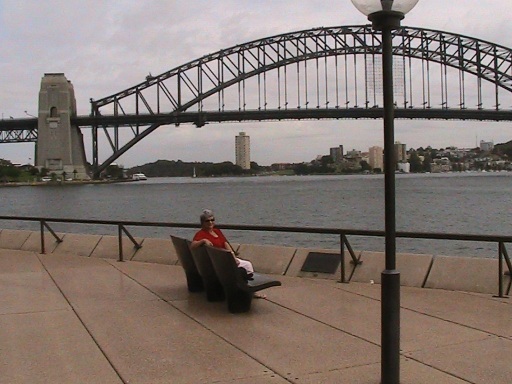 We dined at the Aria Restaurant, enjoying a panoramic view of Sydney Harbour, the Bridge, the Opera House, and an ocean liner moored at Circular Quay. We then wandered up to the Opera House and watched a brilliant performance of "Die Zauberflote", in an English-language production originating from New York's Metropolitan Opera. We thought the soprano who played the Queen of the Night was absolutely fabulous, and the baritone who played Papageno was pretty good as well. Victor was a little disappointed with the tenor who sang Tamino, probably because I have been spoiled by performances on CD. The production included some amazing giant puppetry, depicting magical monsters, with brilliant stage effects and lighting. The following day we toured the Opera House complex, which includes 3 drama theatres, the Opera House itself, and the enormous concert hall. All these are sheltered under the famous "sail" roof, and located at the tip of Benelong point, jutting out into the harbour. We also walked around the rocks and adjoining areas. 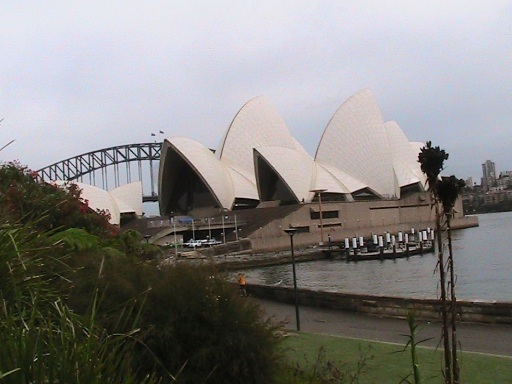 The Opera House and bridge, from the Domain. The Bridge, from Benelong Point. is just behind the flags on the left. 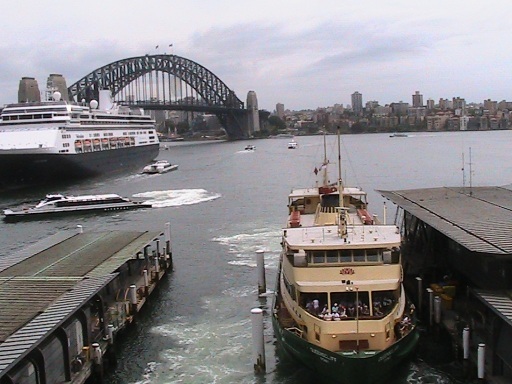 Holland-America liner "Vollendam" at Circular Quay. Back home in Red Gum Rise in February, with enormous effort and skill from Daniel, we completed our new chook house and wired enclosure. On 10th Feb six chooks became its proud residents. Honey was fascinated, and she constantly patrols around the wire or just sits for hours admiring the girls. 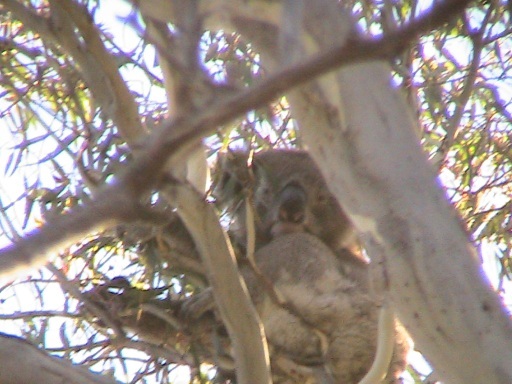 And a koala bear arrived in a tree just above. A Koala just above our new chook house. Our new chooks. 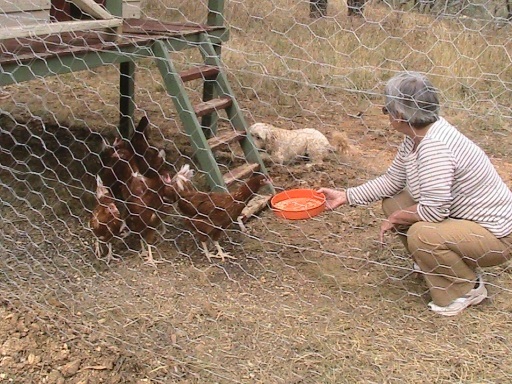 Sadly, a few weeks later, whilst our chooks were rambling around our garden, a fox sprang up, stole, and killed one of the hens, so now we only have 5. They are now laying eggs every day. Most days we get 5 eggs! The hens have to stay inside their wired enclosure now, to be safe from the foxes. Honey is really friendly with our 5 chooks! Daniel and Karen getting familiar with a 'roo. In August we had a lovely visit from Karen, Mathew and Daniel. They flew down from Brisbane and stayed one week with us. Mathew and Daniel really liked the play equipment at one of our nearby parks, and they enjoyed feeding the ducks at the pond there. 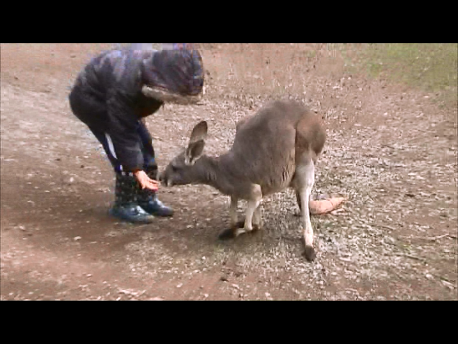 One day we went to a wildlife sanctuary at Cudlee Creek, where the boys were able to roam freely amongst the tame kangaroos and wallabies. We have had our sheep for about 3 years, but we sold them in August. They were successful in keeping the grass low as a fire-prevention measure, which was our objective. But we have gradually realized that they chew to the ground any new tree shoots the instant that they emerge. So as the old eucalyptus trees gradually shed branches and eventually die, there are no new young ones to replace them. We totally rely on the fallen branches from our own trees for our firewood supply, and we want this to be sustainable. We could foresee that the 8 acres where the sheep grazed would eventually become barren in the long term. In our other 8 acres we have lots of lovely new young eucalyptus and wattle trees growing up. Having the property divided into two equal halves, one side grazed, the other not, has provided us with a reasonably scientifically controlled experiment! Barbara joined U3A "University of the Third Age" at the beginning of the year, to attend singing classes. Since then she volunteered to help with the administration, and as a result she is sweeping into the role of Secretary. This week she has worked "at the office" for 4 out of 5 days, but she hopes that the pace will settle down somewhat. Victor continued his active role with the Chamber Music Players. At a playing day in September, he arranged music for a decet of 2 flutes, 2 clarinets, 2 violins, viola, 2 cellos and piano. Barbara played 2nd clarinet. We played 3 pieces from Tchaikovsky's Nutcracker Suite, 3 from Handel's Water Music, and a Divertimento by Mozart. I'm writing this paragraph in mid September. Our weather is still cold and we have been lighting our wood fire all day, every day, since the end of April. We are desperately waiting for our weather to warm up, so we can start eating outdoors and perhaps even swim in our pool. We cheered up, and Victor felt honoured when the Unley Symphony Orchestra played the second movement of his composition 'West to East'. They played it at a rehearsal in the Unley Town Hall on 25th September, and it was recorded. They had only rehearsed it once previously, so they stipulated that I must always note that the recording was made at a 'workshop session'. You can listen to the streamed Mp3 audio recording here. Later we even needed to light the fire in the evening of 22nd October, but it has warmed up since then, and we are swimming regularly in our pool. In mid October we went for a short trip north to the Flinders Ranges, staying one night in Quorn and two in Hawker. We climbed Dutchman's Stern for a good view of the mountains, then we visited Wilpena Pound, which is an amazing place, circular in shape, surrounded by a ridge of hills, and with only one narrow entrance. Inside the pound the forest and vegetation are rich and green, whereas outside it is dry and dusty. We then drove along a river bed through Brachina Gorge, observing the remarkable geology of the area. Kangaroos near Dutchman's Stern, Flinders Ranges Barbara on lookout at Dutchman's Stern, Flinders Ranges. The saddest event occurred at the end of the month. Barbara and Victor were devastated when Honey passed away on 30th October. She caught a black red-bellied snake, which bit her. We miss her. She was a real part of our family. We buried her in a shady spot, and Barbara will plant some flowers around her grave. Barbara continues to enjoy playing her clarinet. She practices almost every day, and her skill and tone have advanced wonderfully. She is currently playing the slow movements of both Mozart's clarinet quintet and his concerto, and a lovely sonata for clarinet and piano by Saint-Saens. Victor continues to mess around with programming and web sites. This news blog is part of 'Green Arches', Victor's ancient web site, which has undergone a thorough updating. It now has a uniform top menu, with hovering pull-downs, created using only HTML with CSS, so it is compatible with all browsers. The Uncle William - Battle of the Somme section also has a left panel 'fly-out' menu, so every part of the site can be accessed with very few clicks, and minimal use of the backspace key. There is a new sub-site, 'Victor's ramblings', with his rantings about pompous language, and a few jokes. Victor has also made major improvements to his main music site BestClassicalTunes.com. He has replaced the Sibelius Scorch music scores with PDF music scores, so that they work in all browsers, without any need to upload plug-ins. The Dictionary of Musical Themes has a virtual piano keyboard for playing the first ten notes of a tune, and looking it up in the theme dictionary. This has been sped-up using client-side J-Script, and made compatible with Internet Explorer, FireFox, Google Chrome, and Apple Safari. It has been extended to include options to type in note names instead of using the 'piano' keyboard. These can be English note names, Do Re Mi tonic solfa, German note names, or French/Italian/Spanish note names. Links to streaming audio pages in other free sites have been added to the tune details pages. These permit users to listen to live recordings, in addition to the existing Midi files and music scores. Here are some photos of the Spring wildflowers in our own bush backyard, taken in October this year. In November we took another short trip, this time to the Eyre Peninsula, in the west of South Australia. We stopped briefly at Port Wakefield, at the top of Gulf St Vincent, then we took a good look around Port Broughton on west coast of the Yorke Peninsula. This proved to be a pleasant place with lovely grassy embankments along the sea-front, and an impressive long jetty. We then drove north and stopped for lunch at Port Pirie, at a foreshore park facing the iron smelter! A little further north we stopped at Port Germein, a quiet pretty seaside place with an enormously long jetty. We walked right to the end, 1675 metres or almost exactly 1 mile out to sea! We headed further north to the top of Spencer Gulf and stayed overnight at Port Augusta. The next day we headed south along the east coast of the Eyre Peninsula, and stopped at Whyalla, an industrial town based on iron ore mining and smelting. We then continued south via Cowell, a very windy but pleasant place, where we had a drafty picnic lunch. We liked Arno Bay, but the first place at which we took any photos was Port Neil. Further south, Tumby Bay was a very pretty spot, with white sandy beaches. In the evening we reached Port Lincoln at the southern tip of the Eyre Peninsula, where we stayed overnight. There had been a dreadful bushfire the previous day only 10 kms south east of the town, but the town itself was safe. We watched dolphins sporting in the water, and visited the famous tuna fishing fleet in Port Lincoln harbour. We then visited the Coffin Bay National Park, on the west coast of the Eyre Peninsula, overlooking the Great Australian Bight. This was the highlight of our trip, a beautiful place with craggy limestone cliffs, spectacular rocky seascapes and lovely sandy coves. We stayed here overnight, then headed north up the west coast of the Eyre Peninsula, via Lake Hamilton, to Elliston. This is another pretty seaside place, facing west over the Great Australian Bight. From here we started some serious, boring, long-distance driving, heading east toward home along the Eyre Highway. Our last overnight stop was at Wilmington, a very pretty town in the Flinders Ranges. From here we headed due south through the Clare Valley, to reach home mid-afternoon. Barbara at Port Neil, Eyre Peninsula Pelicans at Port Lincoln. Another beach at Coffin Bay N.P. Masses of inlets and islands, Coffin Bay N.P. Dangerous tracks around Elliston The Big Galah at Kimba, half way between Australia's east and west coasts. Kim and Alex Glenie paid us a flying weekend visit from Sydney. Alex, joined by Austin and Mason, camped overnight in a tent pitched in our bush, and had great fun! On 14th December we celebrated Barbara's birthday with a lovely lunch with Angela, at the "Lord Lyndoch" restaurant at Lyndoch in the Barossa valley. Our Christmas this year will be quiet at home.